ANGELES NATIONAL FOREST >> Coroner’s officials have confirmed that two scorched bodies found in the wake of the 5,400-acre San Gabriel Complex fire in the Angeles National Forest north of Azusa in late June were those of a teenage hiker and his cousin, who had gone missing during a camping trip into area just hours before the fast-spreading fires ignited, authorities said. The remains of Johnathan Adrian Pardo, 16, and Carlos Antonio Perez, 31, were first discovered about 2 p.m. June 7 along San Gabriel Canyon Road, just east of the Morris Dam, near the origin point of the Reservoir Fire, according to Los Angeles County sheriff’s and coroner’s officials. Both were described as Los Angeles residents. Worried family members reported Pardo and Perez missing on the evening of June 23, after they failed to return from the forest, Azusa police Sgt. Terry Smith said. Family reported they had gone camping and fishing in the forest on the morning of June 20, just hours before the Reservoir Fire ignited nearby at about 11 a.m. Less than two hours later, the Fish Fire also began tearing through brush in the area. Searching for the missing cousins was limited as the wildfires continued to rage, officials said. The remains were recovered from the forest June 8, the day after they were discovered. Though officials and family members, some of whom joined officials in the search, suspected they knew who the bodies belonged to all along, official identification at the coroner’s office was delayed due to the charred condition of the remains. Causes of death for both Pardo and Perez have not yet been determined, according to Ed Winter, assistant chief of operations at the Los Angeles County coroner’s office. The Reservoir fire was sparked when a truck crashed off the side of the road, authorities said. The driver of the truck, 53-year-old Michael Spengler, died in the crash, coroner’s officials said. An autopsy determined he died from multiple blunt force injuries and thermal burns. The death was ruled accidental. The Reservoir fire, along with the Fish fire, which ignited just a few miles away the same day, became known as the San Gabriel Complex fires, which burned for more than a week before being fully contained. More than 1,300 residents were evacuated as a result of the fire, but no structures were damaged or destroyed. 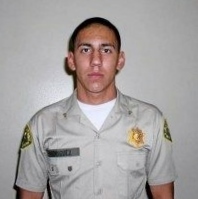 SOUTH WHITTIER >> Five years have passed since the day a sheriff’s Explorer Scout and his friend were gunned down in South Whittier. But more than 100 loved ones and fellow Explorers took to the street Sunday to commemorate the anniversary of the double-slaying to make it clear that the victims are not forgotten and the search for the killer will not end until justice is served. The army of marchers demanding justice for 19-year-old Norwalk sheriff’s Explorer Cesar Rodriguez and 24-year-old Larry Villegas has maintained its annual vigil in the years since the Aug. 28, 2011, drive-by shooting in the 11800 block of Painter Avenue. Each year since the killings, family, friends, colleagues and sheriff’s officials have joined together to march through the streets of south Whittier, stopping to leave flowers and light candles on the parking lot where Rodriguez and Villegas lost their lives. At the end of the march, Sgt. 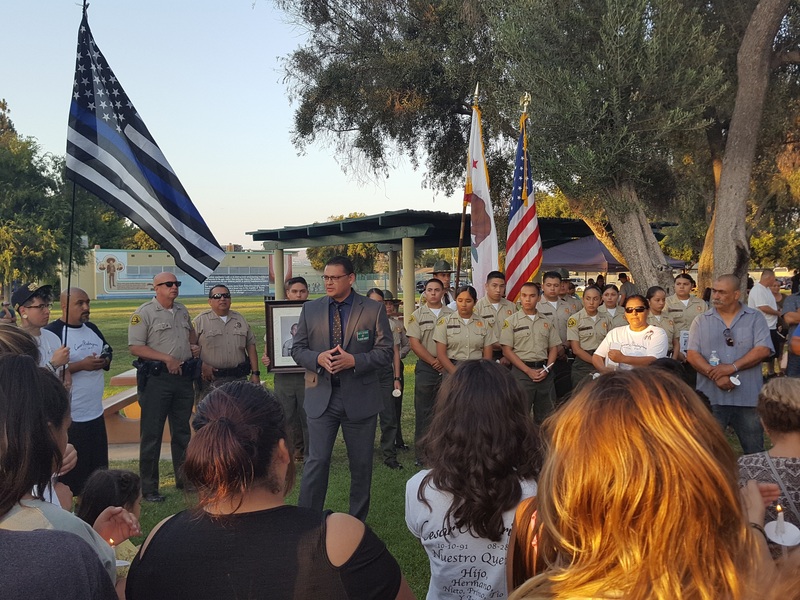 Michael Rodriguez of the Los Angeles County Sheriff’s Homicide Bureau, who is handling the investigation, addressed the crowd assembled at Amelia Mayberry Park. The lack of answers is the most difficult part of dealing with the loss of Cesar Rodriguez, said his mother, Lupe Rodriguez. And although justice would not bring her son back, the mother said it would help her heal a great deal. “I have to live to see justice,” she said. Rodriguez and Villegas had just left a friend’s house when a gray Toyota Scion drove up, Los Angeles County sheriff’s Deputy Bill Brauberger said at the time. The driver opened fire, mortally wounding booth, before fleeing the scene. The hunt for the killer has continued ever since. And family members have vowed to continue their yearly vigil until the killer is caught. The key to solving the case likely lies with a witness who has yet to come forward, according to officials and family members. Rodriguez implored anyone with any information on the shooting to call the sheriff’s Homicide Bureau at 323-890-5500. Tips may also be submitted anonymously to L.A. Regional Crime Stoppers at 800-222-8477. PHOTOS: [ABOVE] – Sgt. 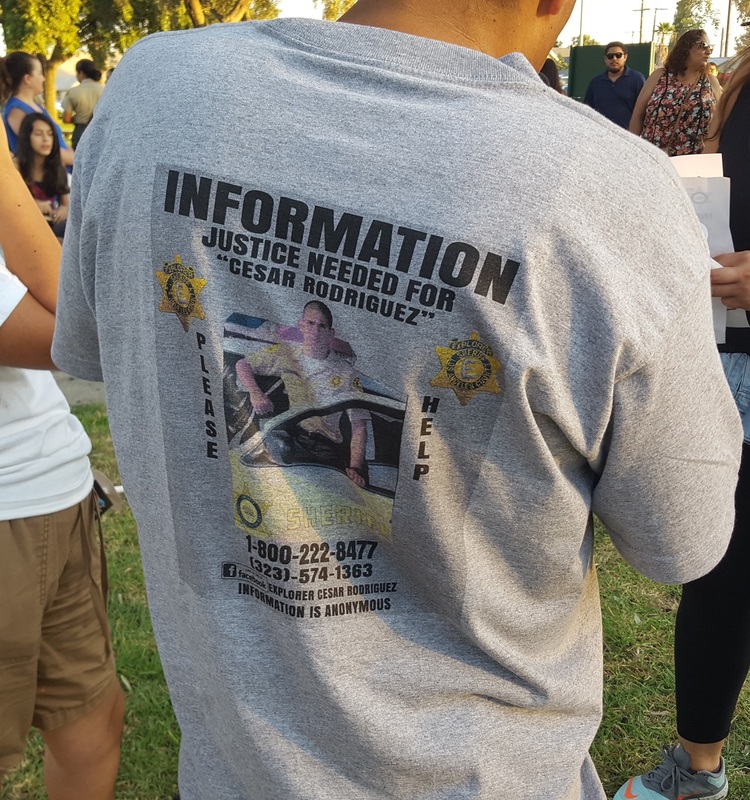 Michael Rodriguez of the Los Angeles County sheriff’s Homicide Bureau speaks to marchers at Mayberry Park in South Whittier after a march commemorating the 5th anniversary of the fatal shooting of a 19-year-old sheriff’s Explorer and his 24-year-old friend in South Whittier on Sunday, Aug. 28, 2016. [CENTER] – Cesar Rodriguez, 19, of Whittier. 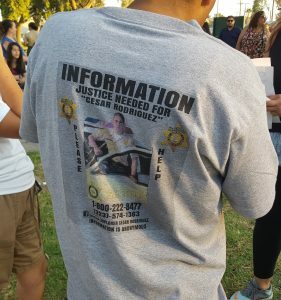 (courtesy) [BELOW] – A T-shirt worn by a marcher seeking information regarding the fatal shooting of 19-year-old Los Angeles County sheriff’s Explorer Cesar Rodriguez and 24-year-old Larry Villegas during a march to commemorate the 5th anniversary of the double-slaying on Sunday, Aug. 28, 2016. 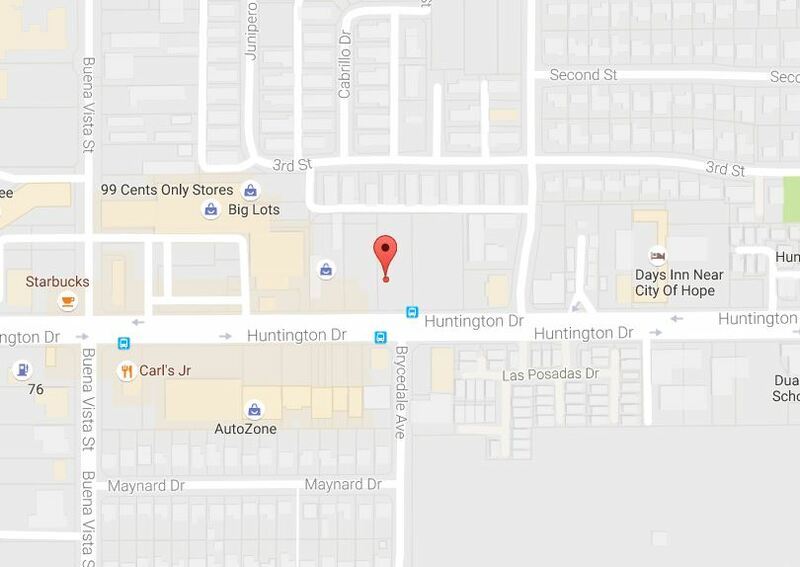 COVINA >> A man showed up at a hospital with stab wounds after a fight broke out at a house party in an unincorporated county area near Covina during the early-morning hours Sunday, authorities said. The stabbing was first reported about 4:25 a.m. after the victim, a man in his early-20s, arrived at a local emergency room with two stab wounds, Los Angeles County sheriff’s Sgt. Omar Carbajal said. Deputies determined the victim had been stabbed when fight broke out at a house party in the 16100 block of Elgenia Street, the sergeant said. The man thought he had merely been punched during the incident, but realized shortly after that he had been stabbed, Carbajal said. No further details, including a suspect description, were available. Anyone with information can reach the sheriff’s San Dimas Station at 909-0450-2709. Tips may also be submitted anonymously to L.A. Regional Crime Stoppers at 800-222-8477. 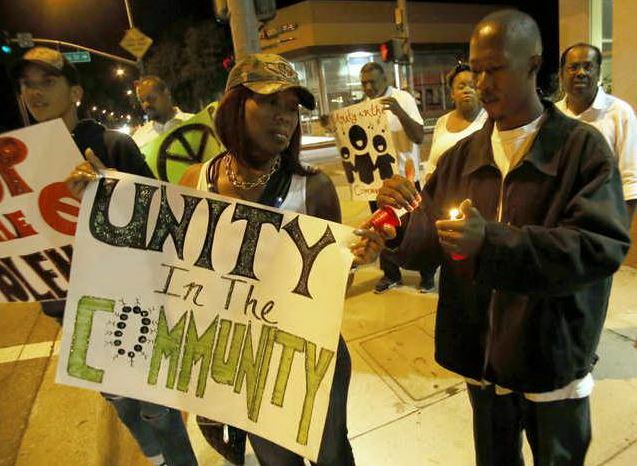 ALTADENA >> Fed up with a spate of shootings that has left at least four people wounded and a 4-year-old boy dead in recent weeks, members of the Altadena community held a silent walk for peace in an effort to take back their streets from violence. 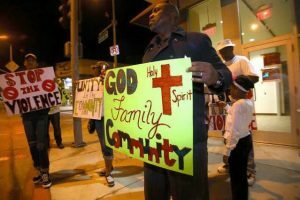 Marchers of all ages gathered at Lincoln Avenue and Woodbury Road, before making their way to Lincoln Avenue and Figueroa Drive in a “Mile of Men” march held in conjunction with Hillside Tabernacle Church. He was walking home from a friend’s house when he heard someone following behind him, the grandmother said. He turned around just in time to see someone in a white T-shirt opening fire with a handgun. The victim fled his attacker, but was wounded in his legs. “Wrong place, wrong day,” Liddell said. The shooting remains unsolved. Liddell’s grandson, who she said has no gang-involvement, is recovering well from the shooting and took part in the march. Despite his physical progress in his recuperation, he is continuing to deal with psychological issues from the attack, Liddell said. He becomes alarmed when he hears loud noises, such as balloons popping. COVINA >> Two men with a handgun robbed a Covina RadioShack store, as well as its employees, late Friday, police said. 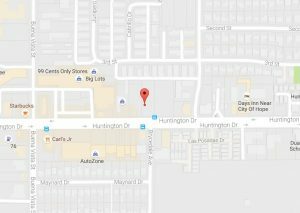 The robbery unfolded shortly after 8:20 p.m. at the electronics store at 1065 Badillo Street, Covina police Lt. Dave Foster said. The robbers first posed as customers and asked to see some items, the lieutenant said. But when it came time to pay, one of the men pulled a small handgun instead, he said. The gunman demanded money from the cash register, as well as the two employees’ wallets and cell phones. The robbers then grabbed the items they had selected from the counter and fled, according to Foster. They were last seen driving away in a dark-colored pickup truck. The victims suffered no injuries. Police described the robbers as two Latino men in their late-30s to early-40s. One stood about 5 feet 11 inches tall and weighed 190 pounds, while the other was about 5 feet 4 inches tall and 140 pounds. Anyone with information can reach the Covina Police Department at 626-384-5665. Tips may also be submitted anonymously to L.A. Regional Crime Stoppers at 800-222-8477. BASSETT >> Deputies found no suspects or victims after the occupants of two vehicle engaged in a rolling gun battle in Bassett Saturday afternoon. The shoot-out was reported just after 1:20 p.m. at 3rd and Proctor avenues in the unincorporated county area, Los Angeles County sheriff’s Sgt. Rico Sandoval said. Witnesses reported seeing a light-colored sedan and a dark-colored SUV trading gunfire, he said. No one was found wounded at the scene and no gunshot victims connected to the shooting had turned up at any local hospitals Saturday afternoon, the sergeant said. SOUTH EL MONTE >> Two armed robbers held up a South El Monte bank branch Friday, officials said. The crime took place about 11:40 a.m. at the Bank of the West, 2041 Durfee Ave., Los Angeles County sheriff’s Sgt. Oscar Lopez said. At least one of the bandits brandished a handgun as they robbed the bank branch of an undetermined amount of cash, he said. They were described only as male suspects wearing black hooded sweatshirts. The robbers were last seen fleeing the area on foot, he said. No injuries were reported. Further details regarding the circumstances of the robbery were not available Saturday. DUARTE >> Investigators did not suspect foul play after a man was found dead in a vacant field in Duarte on Saturday morning, authorities said. 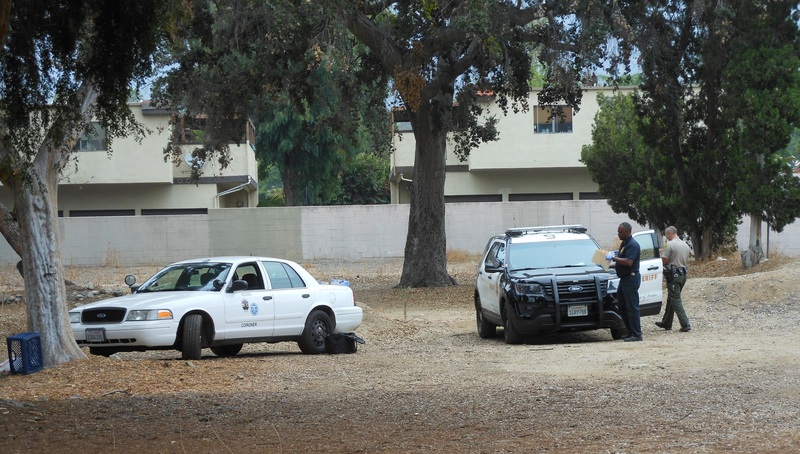 A person flagged down a deputy about 8 a.m. to report finding an unresponsive man lying in a dirt field dotted with trees in the 1400 block of East Huntington Drive, just east of Buena Vista Street, Los Angeles County sheriff’s Lt. Ronald Daily said. The man was yet to be identified, Daily said. He appeared to be homeless and was estimated to be in his 50s. Officials found no signs of foul play involved in the death, according to the lieutenant. Los Angeles County Department of Coroner-Medical Examiner officials retrieved the body are conducting an investigation into the man’s cause of death. COVINA >> A Covina man angered over his misdemeanor arrest ended up right back behind for felony vandalism after he smashed the front glass door of the Covina Police Department with a rock immediately upon his release from jail Friday afternoon, police said. Jose Alberto Melendez, 54, was released just after 5:10 p.m. from the Covina Police Department’s jail, 444 N. Citrus Ave., after being arrested earlier in the afternoon on suspicion of trespassing and possession of drug paraphernalia, Covina police Lt. Dave Foster said. He immediately walked from the back of the building, where he was released, to the front of the police station, the lieutenant said. Melendez threw a rock through the plate glass door of the station, which was seen and heard by several department personnel, according to the lieutenant. Officers then re-arrested him just outside the police department. According to county booking records, Melendez was being held in lieu of $5,000 bail pending his initial court appearance, scheduled Tuesday in the West Covina branch of Los Angeles County Superior Court. 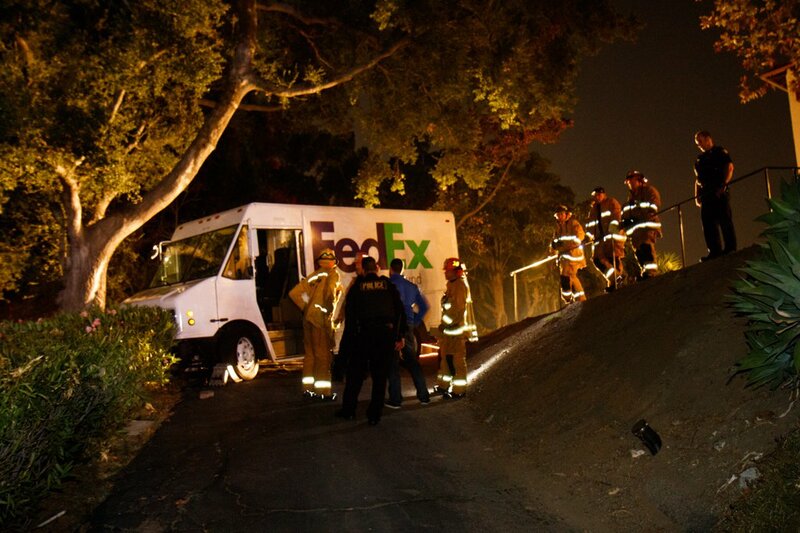 PASADENA >> A FedEx delivery truck ended up precariously perched atop a Pasadena hillside after a crash late Friday, officials said. 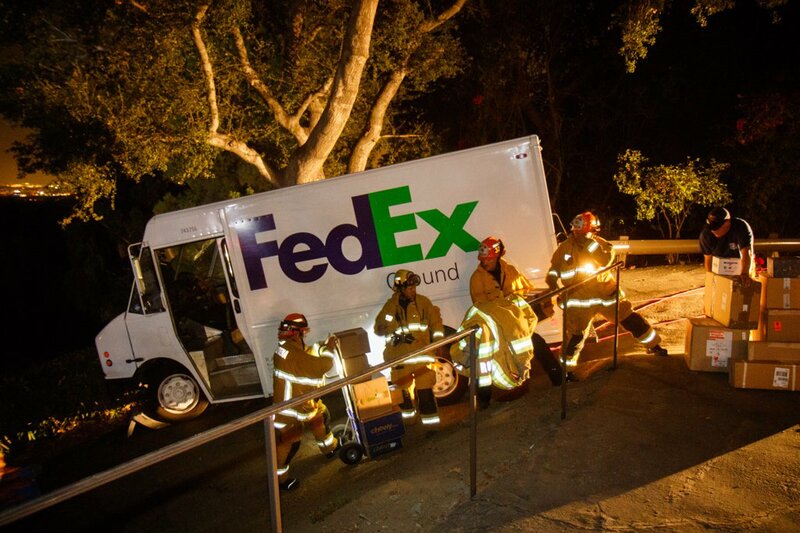 The crash took place about 7:40 p.m. in the 400 block of Patrician Way, Pasadena police Lt. Jason Clawson said. The driver had just made a delivery when he apparently took a turn too sharply, the lieutenant said. The truck came to a rest with one of its wheels hanging over the roadway, dangling atop a hillside, he said. Police said the driver suffered no injuries. 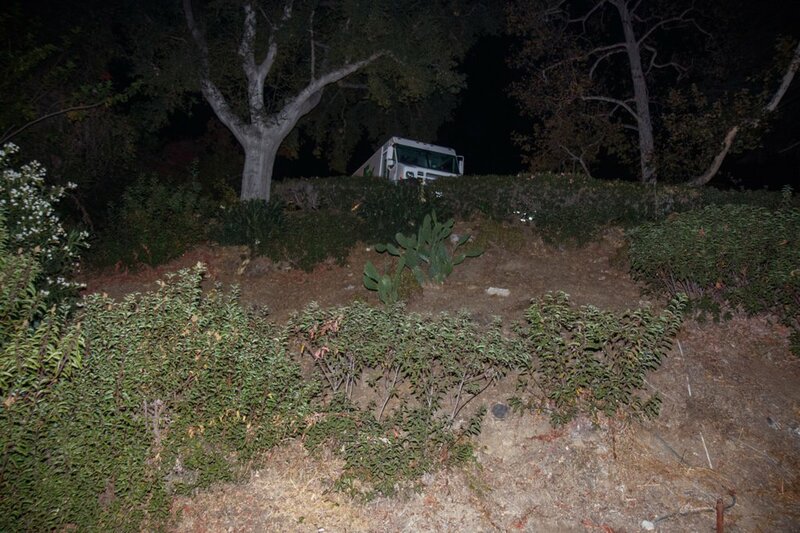 A home at the base of the hillside where the truck was perched was evacuated as a precaution as officials worked to safely bring the vehicle back onto the roadway.